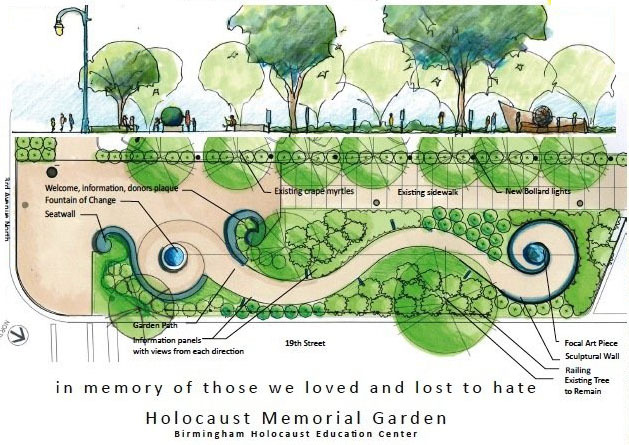 A routine funding request before the Birmingham City Council regarding a planned Holocaust memorial in Birmingham passed unanimously on June 28 — but the week before was anything but routine when the item first came up. The item before the Council called for a $45,500 allocation, transferred from the Mayor’s Office, Professional Fees for Youth Services budget to a non-departmental capital improvement fund, for the fiscal year ending June 30, 2016. The memorial is being planned by the Birmingham Holocaust Education Center for a “small pocket park” along 19th Street between Third Avenue North and the alley to the north. A BHEC fundraising campaign is planned to raise the estimated $550,000 cost privately; the city funding was to remove existing structures and clear the site. The city’s Design Review Committee reviewed and approved a conceptual design for the memorial in 2014. It has a “Make a Change” theme with a walkway from the Fountain of Change, a floating granite sphere, to a focal art piece. A sculptural wall along a pathway between the two will have educational panels on the effects of prejudice and stories of heroism. Shadow Lawn, an African-American cemetery, is located just south of Elmwood Cemetery and is in Tyson’s district. It dates back to the 1930s and has over 100 Civil War veterans, and Michelle Obama’s great-great-grandfather. The cemetery went bankrupt in 2000, and a non-profit association took over in 2005. For years, Tyson has sought city assistance for the cemetery. At the meeting, Tyson erroneously referred to Shadow Lawn as the oldest cemetery in the city, the state and even the nation at different points during her questioning. Councilor Valerie Abbott asked about the unfinished Sept. 11 memorial and whether it was in the same place. The Sept. 11 memorial is in the second half of the block, north of the planned space for the Holocaust memorial. Councilor Steven Hoyt suggested the city provide a memorial at the entrance to Shadow Lawn, which would be permissible for the city to do. The BHEC was “surprised and disappointed” by the misunderstandings at the June 21 meeting. In a statement, BHEC Executive Director Rebecca Dobrinski said the memorial would teach the universal lessons of the consequences of prejudice and hate. “That is the lesson of the Holocaust,” and one which ties into the nearby Civil Rights District. In the days that followed, members of the Jewish community quietly reached out to members of the Council to answer questions, and the item passed unanimously on June 28. In the days after the June 21 meeting, Tyson especially took umbrage at a column in the Birmingham News by John Archibald, accusing her of playing the race card and demeaning the Holocaust with the “dead is dead” comment, which was in the headline. Shadow Lawn “is the final resting place of some who survived slavery, and others who struggled through Jim Crow and the regularity of terrorist bombings of homes and churches — dozens of which happened in this City alone,” she said. For years the city legal department has “shooed away” her requests for Shadow Lawn. Because of that, “I will be clear: I support the use of public funds for the Holocaust memorial. However, I will only vote to allocate these funds when we are provided with clear guidance about the law pertaining to funding memorials,” she said. Her response was given between the June 21 and June 28 meetings. According to Mark Kelly, publisher of Weld for Birmingham, the Birmingham News refused to print Tyson’s response unless Tyson rewrote it to say she had “misstated her case” and not “transfer blame” to Archibald or the Birmingham News. Scales did not respond to a request from SJL for comments.